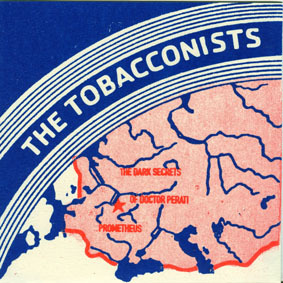 The Tobacconists, being Scott Foust & Frans de Waard, toured in April Europe and recorded a LP worth of material to be released by Tourette Records early next year. In the meantime there is now a 7" with two pieces not played during the concerts. The Dark Secrets Of doctor Perati is a gorgous piece that starts out in true industrial music fashion but ends with a microstoria organ and vocals samples. Prometheus on the other collects many field recordings into a strong rounded off collage of music. Released in an edition of 200 copies, 100 on Plinkity Plonk and 100 on Swill Radio.